See larger Great Ocean Road Map - Victoria Map. Regional Victoria Australia - South West of Melbourne Australia, winding from Geelong to the South Australia border is the Great Ocean Road. The region has some fine attractions, including the Twelve Apostles and Port Fairy, brilliantly restored to its early whaling days with bluestone buildings along the streets. With some of the most dramatic rugged coastal scenery and spectacular views in Australia, there are also great surfing, fishing and swimming opportunities. The region has excellent bush walking trails, vast and beautiful national parks, or go on a whale watching cruise. From Geelong to Nelson, some 300kms to the west, the road winds along cliffs with scenic lookouts, waterfalls, rainforests and historic shipwrecks. The many relaxed maritime villages and coastal towns along the Great Ocean Road offer respite for weary travellers. 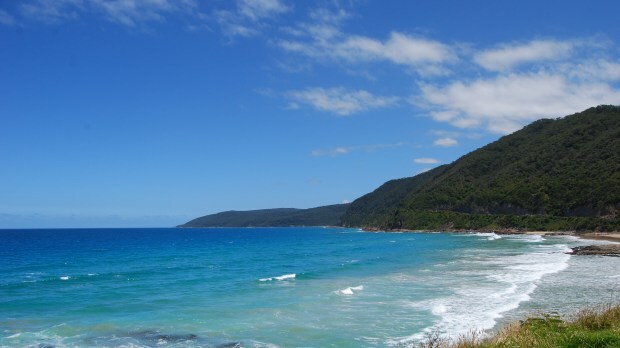 Lorne is noted for its excellent restaurants and café culture, at The Otways you can experience where deep coastal forests meet the rugged coastline. Among the many places to explore on the Victoria South West Coast - Bay of Islands Coastal Park, Mount Eccles National Park, Torquay, Lorne, The Otways, Port Fairy, Cape Bridgewater and the Twelve Apostles. Between King Island (further south, just north of Tasmania) and Cape Otway, the Southern Ocean has played havoc with ships since Europeans began to sail this part of the world. The strong currents, gales, waves, swells and fogs have caused many to founder on what is now known as the Shipwreck Coast. Wreck Beach still has the remains of a number of ships, till they too, disappear forever due to the elements. The Bay of Islands Coastal Park has wonderful coastal scenery and was set up to protect rare bird species and native flora. Take a stop at the Martyrs Bay beach to view the limestone formations in the ocean, similar to the Twelve Apostles further down the road at Port Campbell National Park, but smaller. Port Campbell National Park has wild and beautiful native bushland and Australian fauna. Over millions of years, the area has been sculpted by the ocean to form the Twelve Apostles, the paths and boardwalks has dramatic views of these limestone monuments. When down this way, try not to miss the spectacular London Bridge further down the road. Originally called the London Bridge because of its two arches, one of them has now collapsed, leaving only one to face the ravages of the sea. More about the towns, places and beaches of this beautiful stretch of road: Places to Visit. Restaurants serving excellent seafood, local produce and Victorian regional wines are available at the many villages and towns along the way. The Cafés and Pubs offer Australian as well as international fare, made from local produce. The great Australian pub lunch, a feature of the hearty meals found in pubs throughout the country, is worth trying just for the experience, enjoyed with a nice cool local beer or ale. There are quite a few hotels to choose from, from the budget to five star. Bed and Breakfasts and serviced apartments are also a great way to stay in the region and of course there are plenty of motels along the way.